With the ending of the state fair (where he took third – despite his very crooked toes), and his debut as a 4-H exhibit, Mr Roo, Stew’s replacement, Gandalf, arrived. Raised and handled by kids with a fondness for the Hobbit, Gandalf is mostly what his predecessor was not – even tempered and gentle. A Wynadotte /Americana cross, he is a handsome fella with black iridescent tail feathers, and a lace wing saddle and neck feathers; he is also the perfect arctic chicken with his compact rose comb. Gandalf arrived a couple of Saturdays ago, and made the hen flock his own with a minimum of fuss. His crate sat for some time in the middle of the chicken yard with the birds at stalemate. Neither the rooster nor the hens were going to make the first move, although Wah the Langshan, the most gregarious of the girls, did circle it at far remove. Eventually Gandalf took matters in wing and emerged to explore his new surroundings. In his previous coop, he had been at the mercy of a much more aggressive rooster, as evidenced by his heavily scabbed comb. So one can only image the relief and surge of excitement that he must have felt when he realized he had a flock of hens to call his own. The girls, on the other hand, weren’t so keen on the idea. With Mrs. Dot, the dominant hen, running interference, the rest of the flock took to the coop – where they rocked the walls with their cackling. Mrs. Dot allowed him entrance only after she delivered to him the fowl’s equivalent of a good boxing of the ears: a reptilian flaring of neck feathers and a series of chest butts. Truly, as a Wynadotte with a nearly white front and black leg, back and tail plumage, who brooks no bad behavior from anybody, bird or otherwise, Mrs Dot bears an unsettling resemblance to a crotchety old housekeeper in a third-rate Downton Abbey-esque potboiler. 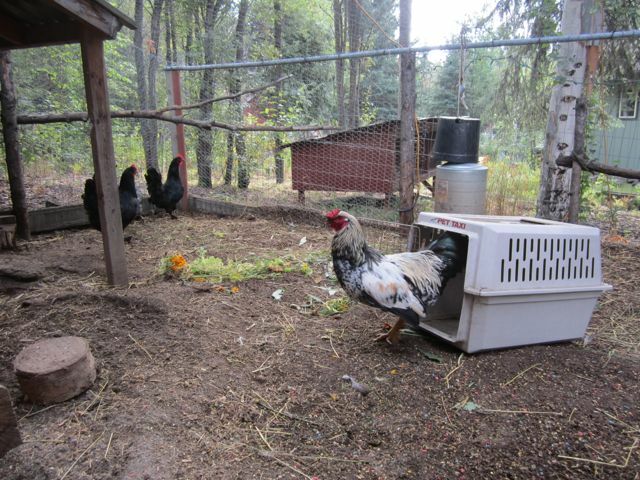 With her role as the coop enforcer established, Gandalf was finally given room to explore the rest of his new home. 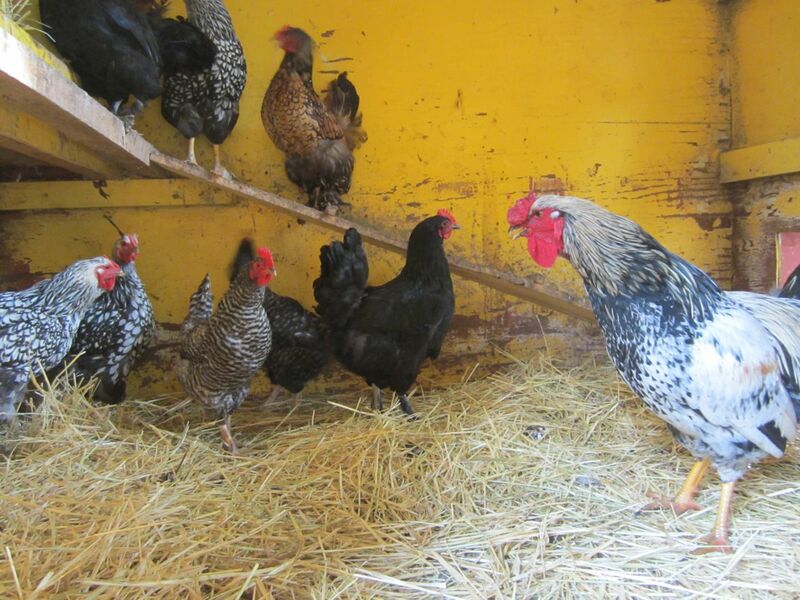 The hens – after clustering and cackling, and cackling and clustering, soon settled down to the new state of affairs. And I quite happily returned to the enjoyment of hearing a rooster calling in my flock, without having to be on my guard for a sudden and unprovoked rooster attack. 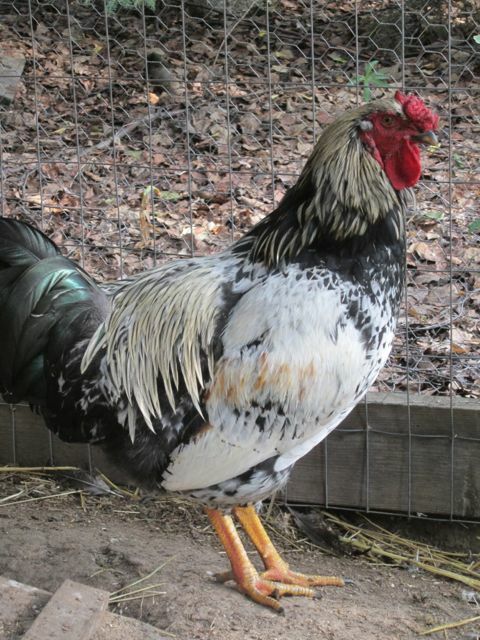 This entry was posted in Flock, Introducing new, Roosters and tagged Introductions, rooster, Wynadotte. Bookmark the permalink.